How to stabilise and embed concrete systems that ensure control and predictability, but at the same time remain flexible and open to new innovations? How to employ new technology to improve the productivity of the enterprise and its staff, in the face of continual pressures on the IT budget? How to ensure that enterprise architecture delivers tangible results today, but remains relevant in an uncertain future environment. Answering these tough questions requires an enterprise to elevate its thinking beyond ‘business processes’, and develop a thorough understanding of its ‘business capabilities’. It demands that the enterprise optimises and leverages these capabilities to improve every aspect of the business – from coal-face operations, to blue-sky strategy. Business capabilities articulate an organisation’s inner-workings: the people, process, technology, tools, and content (information). Capabilities map the ways in which each component interfaces with each other, developing an intricate line-drawing of the entire organisational ecosystem at a technical and social level. By understanding one’s current business capabilities, an organisation is armed with a strategic planning tool. We refer to what is known as the BIDAT framework – which addresses the business, information, data, applications and technology architecture domains. From this analysis, the journey to addressing the organisation’s enterprise architecture estate begins. This culminates in the organisation being able to dynamically optimise, add and improve on its capabilities as the external environment shifts and evolves. A BIDAT approach provides a permanent bridge between the two islands of business architecture and technology architecture. Put another way, business capability management utilises the right architectural solutions to deliver the business strategy. 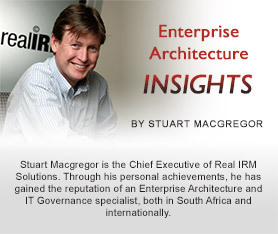 In this way, enterprise architecture is inextricably linked to capability management. It is the integrated architecture (combined with effective organisational change leadership) that develops the business capabilities and unleashes their power. "Capabilities map the ways in which each component interfaces with each other, developing an intricate line-drawing of the entire organisational ecosystem at a technical and social level." This can at times feel very conceptual and hard to apply to real-world environments. Perhaps the best recent example of tangible widespread implementations of a capability-based enterprise architecture approach is in South Africa’s minerals and mining sector. Known as the Exploration and Mining Business Capability Reference Map, and published as part of a set of standards, this framework was developed by The Open Group Exploration, Mining, Metals and Minerals Forum (EMMM). Focussing on all levels of mining operations, from strategic planning, portfolio planning, programme enablement and project enablement – and based on the principles of open standards – this framework provides miners with a capability-based approach to information, processes, technology, and people. The Reference Map isolates specific capabilities within mining organisations, analyses them from multiple dimensions, and shows their various relationships to other parts of the organisation. In the context of increased automation in the mining sector, this becomes an invaluable tool in determining those functions that are ripe for automation. In this new dimension, this new era of business, there is no reason why achievements from the EMMM’s Business Capability Reference Map cannot be repeated in every industry, and in every mid- to large-scale enterprise in South Africa.